In Week 2 of the World Football League’s second season, the Charlotte Hornets took on the Memphis Southmen on August 9, 1975 at the Liberty Bowl. There were 19,729 fans in attendance for the Saturday night matchup, including singer Elvis Presley. The Southmen, popularly referred to as the “Grizzlies” by their fans, had put together the league’s best record in 1974 under Head Coach John McVay, although they had come up short in the postseason. They looked to be an even stronger club with the addition of the celebrated trio of FB Larry Csonka, HB Jim Kiick, and WR Paul Warfield, who were signed away from the NFL’s Miami Dolphins amid great fanfare (pictured above are Csonka, at left, and Kiick). However, the Southmen had barely edged Jacksonville to win their first game. For Charlotte Head Coach Bob Gibson, who had been offensive backfield coach with the Southmen in ’74, the game in Memphis was something of a homecoming. The team he was now coaching started out as the New York Stars before moving to Charlotte midway through the previous season. While they still had Tom Sherman, along with ex-Yale star Brian Dowling, available at quarterback the Hornets had lost many of the veterans, mostly from the NFL Jets, who had been on the roster the previous year. They were 0-1 after having lost their season-opening game to the San Antonio Wings. In the first half, Charlotte was dominant on defense but didn’t score until getting a 25-yard field goal by Pete Rajecki late in the second quarter. However, the Hornets got the ball back quickly when CB David Thomas fumbled after returning the ensuing kickoff 22 yards and was hit by G John Culpepper. LB Tom Embrey grabbed the ball in the air and ran it back 22 yards. Three plays later, Brian Dowling tossed an eight-yard touchdown pass to WR Kreg Kapitan. Dowling followed up with another throw to Kapitan to add the action point (in the WFL, touchdowns counted for seven points and were followed by an action point that could not be kicked) and the visitors were up at halftime by a score of 11-0. In the third quarter, things began to turn around. Csonka scored the first touchdown for the Southmen on a pass from QB John Huarte that covered 10 yards. In the meantime, the Memphis defense also took charge, putting pressure on Dowling and stifling the Charlotte offense. Once again in scoring territory, and with the home crowd having come alive, Huarte threw another 10-yard scoring pass, this time to Warfield, who was wide open in the end zone. The action point attempt failed but Memphis had the lead at 15-11. In the fourth quarter, an eight-play drive by the Southmen that covered 51 yards ended with Kiick scoring a touchdown from two yards out. The 29-year-old halfback was the key player on the series, running the ball four times for 26 yards. The action point was successfully tacked on and that was it - the final score was 23-11 in favor of Memphis. The Southmen outgained Charlotte (313 yards to 232), with 199 yards of that total coming on the ground, and also had the edge in first downs (21 to 13). Both teams turned the ball over twice and there were many penalties, with Memphis committing 10 at a cost of 90 yards while the Hornets were flagged 7 times for 44 yards. Larry Csonka rushed for 112 yards on 24 carries and added another 23 yards on three pass receptions that included a touchdown. Jim Kiick ran the ball 12 times for 66 yards and a TD. He was also the team’s most productive receiver with 38 yards on his three catches. Paul Warfield’s 10-yard scoring catch was his only one of the game. John Huarte completed 8 of 18 passes for 101 yards with two touchdowns and none intercepted. For the Hornets, Brian Dowling was successful on 9 of 15 throws for 91 yards with a TD and an interception. Tom Sherman also saw action and added 4 completions out of 9 passes for 48 yards with one intercepted. HB Don Highsmith rushed for 63 yards on 23 carries and caught 6 passes for 64 more yards. The Southmen went on to post a 7-4 that placed them second in the Eastern Division at the point that the WFL folded in October. Charlotte was 6-5 and tied for third in the division with Jacksonville. Of the celebrated trio of ex-Dolphins, Jim Kiick rushed for 462 yards and 9 touchdowns on 121 carries (3.8 avg.) and caught 25 passes for 259 yards and another TD. Larry Csonka, who was slowed by injuries, gained 421 yards on 99 attempts (4.3 avg.). Paul Warfield had 25 pass receptions for 422 yards (16.9 avg.) and three TDs. 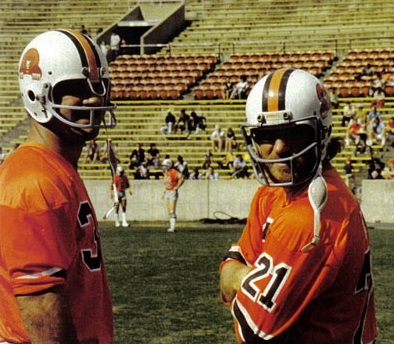 All three returned to the NFL after the demise of the WFL.